What more festive thing to make during the holidays than a gingerbread “something.” Some people make gingerbread houses, we make gingerbread sleds! Some people make gingerbread houses, others make gingerbread men, but in my family growing up, my mother always slaved over gingerbread sleds – making the dough, rolling it out, tediously cutting around the paper patterns, assembling the sleds, etc, so that we children could excitedly decorate them, fill them with goodies and take them to neighbors and friends. And don’t forget the part about eating our fill of candy while decorating. After attempting to make these the first year of my marriage, I completely nixed the tradition and called my mom to tell her how much I appreciated her toiling over these sleds year after year. It was hard work! However, at the encouragement of my husband, I have again adopted this holiday tradition since our children are old enough to have fun with it. It is well worth the effort, even though you will usually find me complaining while rolling out and cutting the dough. This year, I did some research and found a company that makes a kit for you to make your own cookie cutters and did just that, made my own gingerbread sled cookie cutters. It completely revolutionized the process. For those who don’t want to do that, I have included the age-old patterns my mom used for years to cut around with a sharp knife (enlarge the image to 8 1/2 X 11 and you’ll have the correct pattern dimensions). Enjoy! 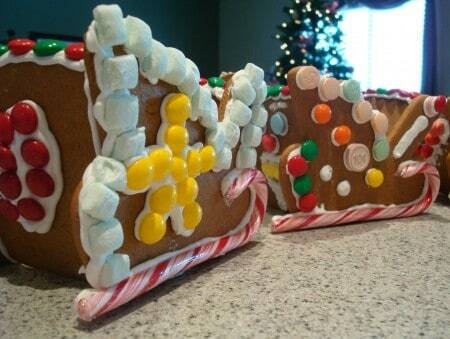 CLICK HERE FOR A PDF OF THE CUT-YOURSELF GINGERBREAD SLED PATTERN. In a large bowl, use mixer to beat shortening, brown sugar and molasses until well combined. Stir in water. Beat in flour mixture gradually. When dough becomes stiff, work in remaining flour mixture with wooden spoon, mixing well. Wrap and chill dough several hours. Divide dough in thirds. Roll out on floured surface to 1/8 to 1/4-inch thick. Place patter on dough and carefully cut out with small pointed knife. Reverse pattern for cutting 2nd side of the sleigh. Place pieces on greased and floured cookie sheets and bake 15 minutes at 350 degrees. Cool on cooling rack and let stand several hours to dry out (I usually make them a few days before I am going to put them together so they are dry and don’t bend and break). **Rolling the dough about 1/8-inch thick, I can make around 8 sleds per batch of dough. For the icing, beat 8-10 minutes or until medium peaks form. Keep bowl covered with a damp towel so that the icing does not get hard. Assemble the sleighs the night before decorated (if you can't do the night before, at least allow 5-6 hours for sleds to dry). Store extra frosting in the refrigerator wrapped in plastic wrap. if I wanted to use this dough to make the gingerbread houses, that you made out of graham crackers how many houses could I make out of this dough? turned soft,& the roofs are sagging do you know why this happened? so we stop it from happening the next time, as we have make new ones now, luckily we only made two! Do you live in a humid climate, Monica? That’s the only reason I can think of the graham crackers softening. I also made the graham cracker houses last night and live in a very dry climate and they were fine this morning. Sorry that happened. 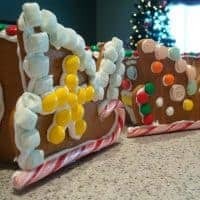 For this homemade gingerbread recipe, it all depends on how big the houses are so it’s hard for me to know exactly how many houses you could get form a batch. Ok I am thinking about attempting these sleds, but I am a little confused about the pattern. The two rectangles…is one for the bottom of the sled and one for the front and back? Thanks! Rachel – I don’t use a piece for the bottom of the sled (I leave that open and usually put the sled on a piece of foil-wrapped cardboard or a paper plate). The large rectangular piece goes on the back of the sled and the small one on the front. Can you tell me where the exact kit you bought is? It would be so much faster to buy that kit. Kimberly – I know there are kits at Sam’s Club, Costco and even Walmart and Target. Do you by chance know what weights to use for the flour? 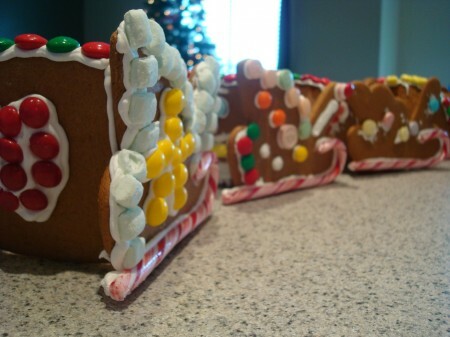 Last time I made gingerbread it ended up as gingerbricks… I just don’t want that to happen again. Hi Nichole, I’m sorry, I don’t know what the flour weight is for the gingerbread. I use the scoop and sweep method for measuring flour in case that helps. This gingerbread is supposed to be pretty stiff (not thick and chewy). Oh my goodness – I love these!!! I haven’t tried it yet but thought I’d pass the idea along. A friend told she had been taught to make burnt sugar syrup. Dip the edges of the pieces in it and stick together. It hardens almost immediately so you don’t have to hold until dry. A mutual friend of ours from Finland taught that. I thought is sounded brilliant!!! Hi Melanie, Thank you so much for directing me to your gingerbread sleds. I am going to use your recipe to build our haunted mansions. These sleds are so cute! I might get ambitious and try to make these come Christmas. Above it says you have included the pattern but I don’t see a link for it…I only see one for the cookie cutters. Am I overlooking it? Oh and by the way, I made your Creamy Chicken and Wild Rice soup today…..oh my it was really really good! So glad I came across your blog(Thank you Pinterest….lol). I noticed you said the frosting can be stored in the refrigerator. I am doing gingerbread houses for my daughter’s school class and need to make the icing. Do you think I could make it the night before and store it in ziploc baggies in the fridge? I’ve never made it the night before and am worried about it getting too hard. Soooo cute! Way too much work for me though. Your friends and neighbors are lucky. You should make sure they see your blog so they can appreciate all the time and energy you put in to their special treat. Hope you guys have a Merry one and thanks for the Christmas card! I love your family picutre on it. For some reason I couldn’t get your cookie cutter link to work, but I think that is the coolest idea. I eventually want to get some of those too, since I am determined to keep this Walker tradition alive in our family. I can’t wait to decorate my very first sled this week!